A friend of mine posted this on Facebook tonight. It seemed remarkably appropriate for my current situation. 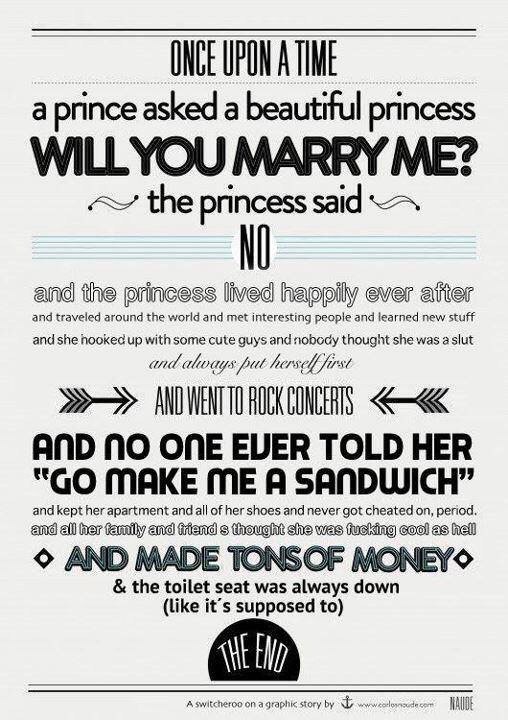 Well, except no princes have been proposing to me lately, however that is hardly the point. I hear women call themselves survivors frequently. I have had that term draped around my neck a time or two myself. I realized today I don’t want to be a survivor. I don’t want to simply survive my life. I want to thrive. I want to find new adventures and challenges. I don’t need to be rescued. Too often we allow the baggage of our past to drag us down. We find ourselves swimming against the current and fighting our own progress. Sometimes it is best to simply relax and see where the river’s flow will take us. I refuse to be a captive to the little voice in my head telling me I can’t succeed. I refuse to settle and fail to accomplish my goals to the absolute best of my ability. I won’t be a victim to my thinking or anyone else’s actions. I have already achieved so much more than I ever believed I would. There is no indication I am going to be a failure. I deserve to give myself a break. Survival is about living with the past. I am going to do well despite the past. I can do anything I want to do. Some people say they are fighters. I don’t want to fight. That is painful and violent. I am going to live my life with an open mind and an open heart. I am not a fighter. Previous Adele. Stop Ripping Out My Heart! Next I am totally taking the train.